The Jathika Hela Urumaya (JHU) yesterday criticized a statement made by the Sri Lanka Muslim Congress Leader Rauff Hakeem that President Rajapksa should defeat "yellow robe terrorism". JHU Parliamentarian Ven. Athuraliye Rathana Thera speaking to Daily Mirror said that Rauff Hakkem is a Minister who does not even practice his own religion properly. It was reported in the Tamil Mirror online that the SLMC Leader and Minister of Justice Rauff Hakeem made this statement during an election rally held last Sunday at Sainthamaruthu (Kalmunai) to introduce SLMC candidates from Kalmunai electorate for the upcoming Eastern Provincial Council Election. According to the report Hakeem addressing the gathering had stated, "It would be welcome if the president who successfully put an end to terrorism, would defeat all sorts of terrorism even if it is "yellow robe terrorism". Muslims living outside the North and East suffer due to this terrorism. These Muslims are unable to pray peacefully in mosques. And even in this Ramadhan month, they have created a situation where Muslims fear to gather for prayer." "Even during the time of the war, Hakeem was supporting the Norwegians and the LTTE. He was in the opinion that the ethnic conflict could be solved by negotiations. However if he is saying that there is "yellow robe terrorism" in Sri Lanka, then he has to explain where and how such acts are taking place? So we ask him to prove his allegations without just making nonsensical statements based without any proof," Rathana Thera said. Meanwhile, responding to these allegations leveled at Jathika Hela Urumaya (JHU) Western Provincial Council Minister Udaya Gammanpilla said that Hakeem's allegations just proves and reflects his double standards and duplicity of his party. "When Hakeem is in Colombo speaking either in Sinhala or in English, he speaks about the traditional friendship between the Buddhist monks and Muslim community while praising the historic relationship between Buddhist monks and Muslims. However contrary to this, when he is in the East speaking in Tamil he criticizes the very same Buddhist monks. Nevertheless while he is criticizing the Buddhist monks in the east, Buddhist monks in Colombo organize breaking fast ceremonies for Muslims," he said. Speaking further Gammanpila also added that SLMC has opted for raising ethnic hatred as an election tactic and a strategy to gain votes by creating sentiments of fear and anger in the Muslim community in those areas while forgetting that the majority of the Muslims are living outside the East. "However JHU would like to remind him that he cannot antagonize Sinhalese or Muslims by making these silly and emotional statements. It is clear that what he is trying to do, is to touch the emotions of the Muslims by bringing up anger and fear in them against Buddhist Monks. 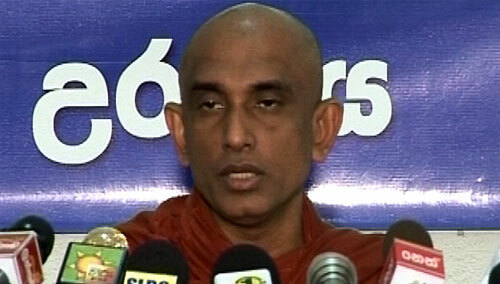 That is why he is comparing Buddhist monks with the LTTE terrorists," Gammanpila said.